The brightness of an LCD backlight depends on a number of different variables. In order to get the best result, and optimize the lighting and display for the intended application , it’s important to understand more about each factor and how they make an impact. Let’s take a look at four of the most important keys to controlling backlight brightness with LCD lighting. Perhaps the most obvious element is the actual amount of power supplied. This is the most straightforward and easiest way to either increase or decrease the brightness of an LCD backlight. Increasing the power to the LEDs, within the manufacturer’s allowable forward current range, increases the brightness of the lights, while decreasing power decreases brightness in the same fashion. Even if a power source remains at a consistent strength, the efficiency of the LEDs and the system as a whole impact how bright the LCD lighting will be. By using superior components and technology, with superior efficiency, more brightness can be squeezed out of the same power source. Factors that may impact LED efficiency include the quality of the die, the chemical makeup of the LEDs, and even the color temperature of the LEDs. 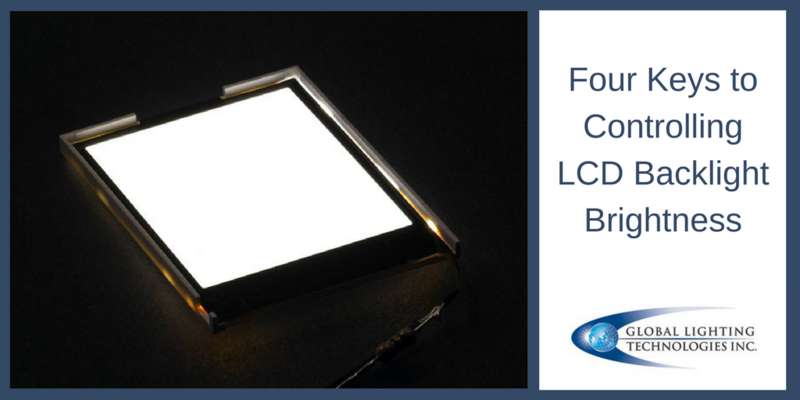 Different types of LCDs offer different degrees of transmissivity, which refers to the degree that a medium allows something such as electromagnetic radiation, or in this case specifically visible light, to pass through it. LCDs may allow less than 1 percent of light to be transmitted from the backlight to the user, whereas others can result in almost no loss. Therefore, it’s essential to consider whether or not a backlight is required when selecting an LCD, and then to select an LCD with good transmissivity. Not to be overlooked is the lightguide. The quality and efficiency of the lightguide will have a dramatic impact on the final brightness of the LCD backlight. The reason is simple enough, as it is the lightguide that directs the light from the LED to the LCD, and much can be lost along the way. Lightguides with high efficiency levels, including those with optical lens based light extraction patterns, can increase efficiency by 20 to 30 percent. By considering these four key factors, any DIY LCD lighting project can become more successful. For more information on a full range of LED and LCD lighting products and technologies, contact us here. In addition to offering LCD backlight products, Global Lighting Technologies is a worldwide leader for developing a full range of efficient, innovative, and customized lighting solutions.